Followup work by Jennifer Parker (then at U Minnesota), Roberta Humphreys, and Jeff Larsen showed that the asymmetry in star counts extended over an even larger part of the sky and "While the region of the asymmetric distribution is somewhat irregular in shape, it is also fairly uniform, stretching over several hundred square degrees on the sky. It is therefore a major substructure in the Galaxy due to more than small-scale clumpiness in the thick disk or inner halo" (Parker, Humphreys, and Larsen 2003). Furthermore, they obtained spectra for 741 stars scattered across these fields. Using the spectral analysis pipeline developed by their collaborator, Tim Beers, they were able to use the metallicity estimates from the spectra to show most of the stars in the sample were Thick Disk stars. 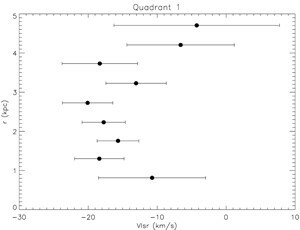 Isolating the thick disk stars, they demonstrated that the " VLSR velocities reveals a significant lag of approximately 80 to 90 km/s in the direction of Galactic rotation for the thick-disk stars in quadrant I, while in quadrant IV, the same population has only a approximately 20 km/s lag confirming the kinematic asymmetry between the two directions" (Parker, Humphreys, and Beers 2004). The asymmetry is due to a fossil remnant of a merger passng through Quadrant I. The thick disk and/or halo is triaxial with the major axis in Quadrant I, thus they asymmetry just reflects that the long axis of the triaxial distribution is nearer to us in Quadrant I than Quadrant IV. The asymmetry is due to a "gravitational wake" caused by the interaction of the thick-disk/inner halo stars with the bar in the disk, which is in Quadrant I, but lies a few kpc beyond the thick disk stars in the asymmetry. In 2006, Roberta Humphreys (U Minnesota), Jeff Larsen (US Naval Academy), and Juan Cabanela (then at St. Cloud State University, currently at Minnesota State University Moorhead) proposed to NSF for a collaborative project to determine the spatial extent of the asymmetry both in star counts and kinematics and to better constrain the origin of the spatial and kinematic asymmetry. 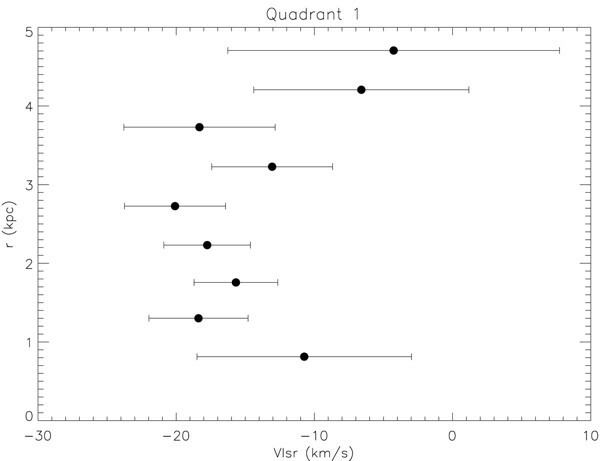 This project focused on obtaining (1) multibandpass CCD observations of 63 roughly 1 degree square fields to extend the star counts to deeper magnitudes and (2) obtaining high resolution spectra of several thousands stars in these fields to allow a more extensive investigation of the kinematics of this feature. By 2008, it was clear the stellar asymmetry had been confirmed by Juric et al (2008) using the Sloan Digital Sky Survey (SDSS). However, their interpretation of the excess in the star counts as a ringlike structure is not supported by critical complementary data in the fourth quadrant, which is not covered by the SDSS. Therefore, we published a short letter (Larsen, Humphreys, and Cabanela 2008) to present stellar density maps from the Minnesota Automated Plate Scanner Catalog of the POSS I showing that the over density does not extend into the fourth quadrant and therefore the over density is most probably not a ring. The asymmetry feature was named the Hercules Thick-Disk Cloud. Our initial analysis of the star count data focused on searching for a clear signature of triaxiality, an asymmetry in the star counts that extended to higher and higher Galactic longitude. However we found no evidence for an excess of faint blue stars at l≥55° including the faintest magnitude interval. This demonstrated the asymmetry's spatial limits and ruled out a triaxial thick disk as a likely explanation of the excess of Thick Disk stars in Quadrant I (Larsen et al. 2010). When we started this project in 2004, there were three proposed explanations for the asymmetry in the star counts and kinematics of the Thick Disk stars: (1) a fossil remnant, (2) a triaxial Thick Disk or Halo, or (3) a dynamical interaction of the Thick Disk stars with the stellar bar. Our new deeper star counts across 63 fields extending to higher Galactic latitude and longitude than previous plate based work, eliminated a Triaxial Thick Disk as an explanation of the observed star count asymmetry. Our spectroscopic observations of over 4000 Thick Disk-candidate stars showed the kinematics of these stars in the asymmetry were strongly tied to their position relative to the stellar bar of the Galaxy in a way that is consistent with a "gravitational wake" induced by the stellar bar in the Disk. Based on our observational evidence, we conclude the best explanation of the Hercules Thick Disk Cloud is that it is the result of the dynamical interaction of the Thick Disk with the stellar bar. Photometric Data: All photometric data associated with Paper II except for data in three fields H300-20, H330-20, H315-20, and H295+31 which we are finalizing the U band data on. The U band data was NOT used in Paper II, but we want to make sure it is acceptible before posting the final version of the tables online.